From 6:30 pm to 8:30 pm, you can sail into a beautiful sunset with your guests and enjoy happy hour on the waters of Cape Cod. While the new school year is around the corner, there is still plenty of time to make the most of your summer days on the water. What better way to enjoy a summer day in August than with an open boat ride aboard The Liberté? With three opportunities to sail per day, you can easily enjoy a sail on the water with friends and family of all ages. Ready to schedule your ride? Get ready to set sail today! On The Liberté, we offer three sailing times per day on every day of the week depending on availability and weather conditions. If you prefer to sail in the morning, our morning sail begins at 10:30 am and ends at 12:30 pm. Costs for morning sails are $25 each for adults and $15 for children under 16. While our morning sail times are most popular for families with kids, you can still enjoy a brunch sail with a Mimosa or a Bloody Mary on board! For guests who prefer an afternoon sail afternoon sail, we offer a sailing time from 2 pm to 5 pm. Enjoy a fun and exciting sail with your family and friends! Costs for afternoon sails are $35 for adults and $20 for kids. Afternoon sails tend to have the most wind, allowing you to see the area with faster speeds. Why limit your summer happy hour to only a bar by the water? 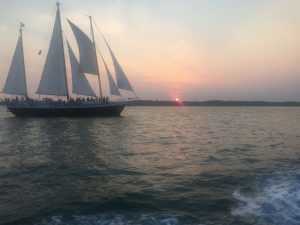 From 6:30 pm to 8:30 pm, you can sail into a beautiful sunset with your guests and enjoy happy hour on the waters of Cape Cod. Like our morning and afternoon sails, you can enjoy a drink from our cash bar onboard. The cost for sunset sails is $40 per person. Guests are welcome to bring food only, and parking is free. Ready to set sail? Purchase tickets on our website or call 508-524-9121 to make reservations today! Enjoy Your Summer Day Aboard the Liberté! The Liberté provides private charters in Annapolis and Cape Cod, as well as public sailings in Cape Cod. Celebrating aboard the magnificent Liberté is a great way to create cherished memories that are sure to last a lifetime. If you want to charter the Liberté for your next corporate event or wedding reception, contact the Liberté today! Call us today and we will be sure to respond within 24 hours. Be sure to also check us out on Facebook, Google +, and Twitter. This entry was posted on Friday, August 10th, 2018 at 9:03 am. Both comments and pings are currently closed.